The Coesewijne Nature Reserve, somewhat north-west of Paramaribo, is a special area in that it differs completely from nature found in the more southern Suriname rainforests. Within this watery area of mangrove forests, swamps and savannahs, we will be searching for giant otters, manatees, capibaras, caimans, monkeys and a remarkable amount of special birds, including the so-called ‘monkey-eating eagle’. This is a wonderful adventure for all ages. 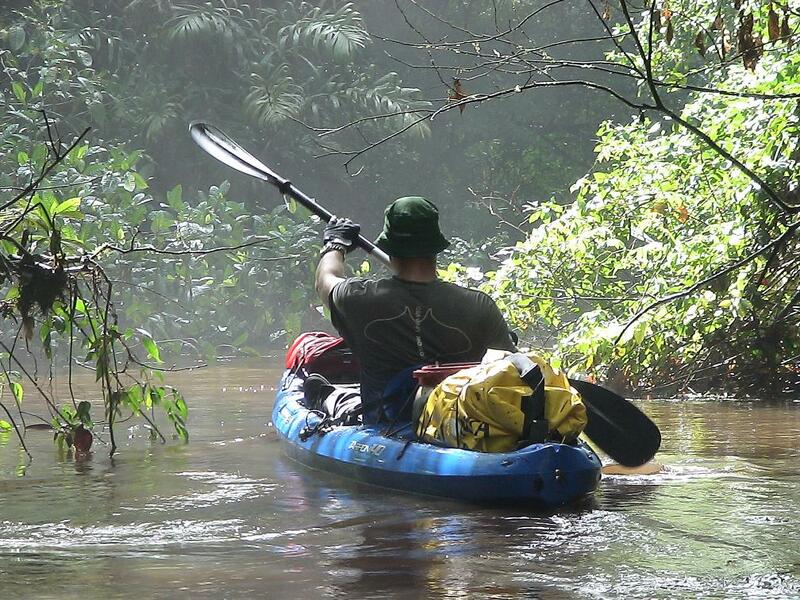 Our journey begins in Paramaribo, where we gather at “Cycling in Suriname” and get taken, along with our canoes, to the starting point of the journey above Coesewijne. On this day we will paddle across the narrow and dense creek, we will have to regularly leave our boats to carry them across obstacles and fallen trees. We set up camp early this day and what could be nicer than enjoying the sounds of the jungle while enjoying a great meal, knowing there’s no one around for miles? Just us and the jungle. Today we keep paddling across the Goliath creek towards its connection with the Coesewijne, where we keep paddling through the Coesewijne natural reserve. Of course, we take breaks every now and then to enjoy the amazing scenery. Many special birds can again be seen here, such as the osprey, kingfishers and different parrots. We begin our final track across the Coesewijne to Stinasu base camp, where we get picked up by our bus. We then reach Paramaribo towards the end of the day. Including: Guide, accommodation in a tent or hammock, meals, transport, rent of a Tarpon 160, camping and canoe equipment.